By Rebecca Duffy | September 29, 2014. Over 30 pay and display park-lets were transformed into various gardens, provoking thought, conversation and creativity as Dublin Park(ing) Day returned to the city on Friday 19 September. This year, the event successfully took place in more than 30 locations around the city, including two parks in the Liberties area at Cornmarket and at Newmarket Square. Stéphanie Fy and Dave O’Connor were the organisers of Dublin Park(ing) Day 2014. Throughout the city the parks offered various activities to take-part in or observe, such as poetry readings, juggling, discussions and live music. The Alice in Wonderland themed park at Newmarket Square went down a treat for young children who were able to engage and interact with the arts and crafts workshop. 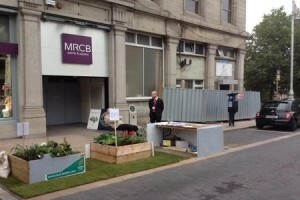 The park at Newmarket Square was supported by Dublin Food Co-op and The Exchange Dublin. The issues of dereliction in the city were discussed in detail at the temporary park at Cornmarket, where eight members of the Green Party participated, including Oisín Ó hAlmháin “We had some great help from Dublin Community Growers and NCAD Students Union. Established by Rebar Art and Design Studio in San Francisco, 2005, the idea is to transform city car parks into public parks where citizens, activists and artists are encouraged to come together for an entire day. Park(ing) Day is “intended to promote creativity, civil engagement, critical thinking, unscripted social interactions, generosity and play” according to founder, Rebar. Despite the classic unpredictability of Irish weather the pop up parks were a success and ran from 12pm until 6pm on Friday. The busy Park(ing) Day was followed by a memorable Culture Night with lots of activities organised throughout Dublin to keep the streets busy.